As the winter weather starts to roll in up north, the hot stove is only getting warmer down south…Orlando to be specific. Rumors are swirling right now regarding the various free agents still on the market and the potential trading scenarios floating around as well. I’m going to hit on a few of these and see if I can get some feedback from the sporting community. First and foremost, let’s start off with everyone’s favorite big spenders–The Cubs. The South-Side’s “Lovable Losers” are doing their best to dispell that image in 2007 by assembling a pennant contender in a matter of a few weeks. Whether or not this gamble will pay off is yet to be seen, but with likes of Derrek Lee, Aramis Ramirez, Alfonso Soriano and Cesar Izturis in the lineup it’s hard to argue with the likehood of the Cubbies make a push for October. The one thing that could stand in their way, however, is a lack of pitching depth. The starting rotation behind Carlos Zambrano (entering a walk year) isn’t to daunting for opposing teams. The Cubs would like to acquire a front-line starter such as Jason Schmidt but with Schmidt’s preference to stay on the West Coast they may be forced to settle for second-tier starters. If they want to make a splash, however, they better move fast as many second-tier darlings like Randy Wolf, Adam Eaton and Woody Williams have already signed on elsewhere. Right now the three front-runners to join the Cubs rotation are Jason Marquis, Gil Meche and Ted Lilly. I think it would be wise for the Cubbies to acquire at least two solid second-tier inning-eater types to round out the rotation. 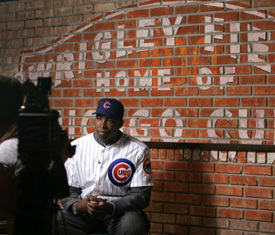 I think the bullpen could be very solid this season, especially if Kerry Wood can remain healthy. He would become the ultimate X-Factor late in a game. Imagine trying to adjust from Glendon Rusch to Wood…good luck with that one. Right now the offense is set–or it sure as hell should be, anyway–if Jim Hendry feels he needs to blow more money on what is easily the best offense in the NL Central, he is probably going to doom the team before the pitchers and catchers report (it’s only 76 days away!). As I’ve said…and reiterated, multiple times…the Cubs need to add pitching depth. Zambrano will be solid. If healthy Prior will be solid. Sean Marshall showed plenty of potential last season and *shutter* Glendon Rusch will always be there. Whether or not the Cubs can lock in one or two solid pitchers to accompany what should be a very good bullpen and a solid front of the rotation will ultimately decide the fate of the Cubs in 2007.